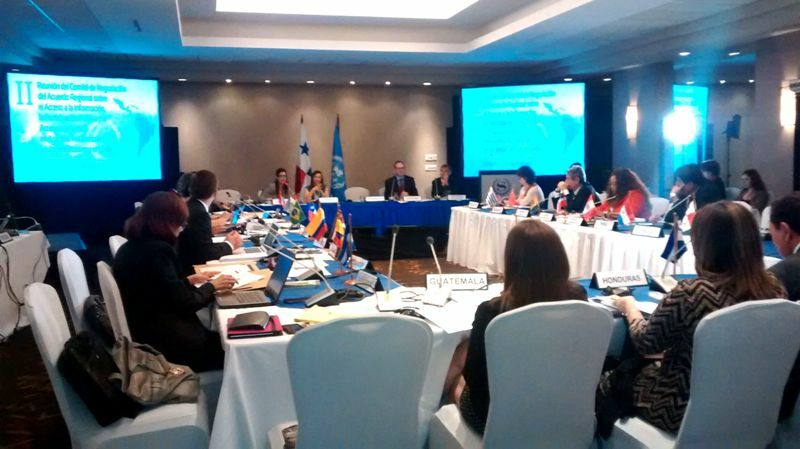 On October 28th, Legislation Lab’s Latin America& CaribbeanPrinciple 10 (LAC P10) was featured during the Second Meeting of the Negotiating Committee of the Regional Agreement onPrinciple 10 of the Rio Declaration onEnvironment and Development in Panama City. Principle 10 is designed to bring 20 countries in Latin America and the Caribbean into negotiations for a regional agreement which will set minimum standards for access to information, participation and justice in environmental matters. During the workshop, the delegates reported on the progress of the public consultation process. The country representatives also acknowledged the positive role of civil society organizations. A number of regional organizations are supporting the dissemination and collection of contributions and comments on the draft document using a variety of communication tools such as social networks, workshops and websites like Legislation Lab. The Legislation Lab website, which is active, is allowing citizens to submit online comments and votes on the preliminary document which will eventually be submitted to The Economic Commission for Latin America and the Caribbean (ECLAC). Legislation Lab will also serve as a repository for public opinion on the various sections of the document. The final text of the agreement is expected to be completed by December 2016. The LAC P10 initiative is a partnership between GovRight and The Access Initiative (TAI). TAI is the world’s largest global network dedicated to ensuring that citizens have the right and ability to influence decisions about the natural resources that sustain their communities.